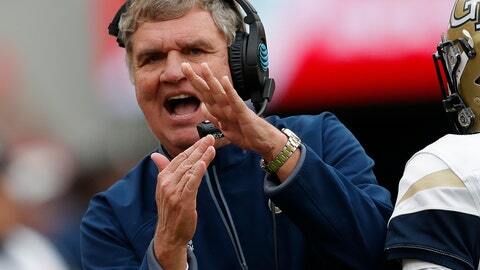 ATLANTA (AP) — Paul Johnson, the longest-serving Georgia Tech coach in a half-century and architect of a triple-option offense that was an anomaly among Power Five schools, announced his retirement Wednesday after 11 seasons with the Yellow Jackets. The 61-year-old Johnson revealed the surprising decision after meeting with his players. It came just four days after Georgia Tech closed the regular season with a lopsided loss to No. 4 Georgia . Johnson, who also coached at Georgia Southern and Navy, compiled a career record of 82-59 at the Atlantic Coast Conference school, including eight bowl appearances and three trips to the league championship game. He will stick around for another month, leading the Yellow Jackets for the final time in their bowl game. Most projections have them going to the Military Bowl on Dec. 31. Johnson planned to discuss his decision at a Thursday morning news conference. During an interview with WXIA-TV outside Bobby Dodd Stadium , he said the decision to retire was entirely his but didn’t rule out a return to coaching. “I’ve been thinking about it for a while,” he said. “I’m not sure I’m done coaching, but I need a break. I’m going to take some time off with the family and decide if I like it. If it works, it’ll be great. If it doesn’t, I’ll resurface somewhere else. This season, the Yellow Jackets bounced back from a 1-3 start to finish 7-5, winning four straight games before a 45-21 loss at Georgia last Saturday. Georgia Tech finished 5-3 in the ACC, its first winning record in conference play since 2014. Johnson is best known for his triple-option offense, which produced gaudy rushing statistics but was criticized for being one-dimensional and out of touch with today’s wide-open offensive schemes. The Yellows Jackets lead the nation with an average of almost 335 yards per game on the ground, but they completed only 11 passes in their last five games. Georgia Tech athletic director Todd Stansbury praised Johnson for his long tenure at the school. He demonstrated his support for the coach this past spring by working out a two-year extension that ran through the 2022 season. Johnson’s current deal paid him roughly $3 million a season. Bobby Dodd, Bill Alexander and John Heisman — all members of the College Football Hall of Fame — were the only coaches to serve longer and post more wins at Georgia Tech. Johnson’s overall record is 189-98, with only four losing seasons in his 22 years as a head coach. He guided Georgia Southern to a 62-10 mark and a pair of FCS national championships before moving to Navy in 2002. After a 2-10 mark in his debut year, the Midshipmen ripped off five straight winning seasons and bowl appearances. He never lost to Army, going 6-0 against the Cadets with an average margin of victory of more than 28 points. “Those were some really good teams with some really great players and a terrific coach in Paul Johnson,” Army coach Jeff Monken said Wednesday. Johnson still has ties to the Army-Navy rivalry. Ken Niumatalolo worked under Johnson and succeeded him as head coach of the Midshipmen. Monken also worked on Johnson’s staff at both Navy and Georgia Tech. Johnson was a hard-driving coach who wasn’t afraid to express his opinions, especially when it came to those who criticized his offense as old-fashioned or complained about the lack of big-name recruits compared to rival schools such as Georgia and Clemson. He did beat the Bulldogs three times, most notably winning back-to-back thrillers in Athens before this season’s one-sided loss between the hedges. Johnson couldn’t help gloating a bit after Georgia Tech rallied for a 28-27 victory over Georgia in 2016. “Not bad for a bunch of 80th-ranked recruiting classes,” he quipped. But his unique offense always made him a lightning rod for criticism, especially when the Yellow Jackets stumbled to a 3-9 mark in 2015 on the heels of an 11-win season that included an Orange Bowl victory. Even with this season’s strong finish, his record over the last four years was just 24-24. Johnson’s only ACC title, in 2009, was vacated because of NCAA sanctions.